Your child’s smile deserves fantastic dental care from the start. As they grow, and their teeth begin to arrive, the approach to providing that care can change. Your St. Louis, MO dentist can help you manage your child’s oral health care needs over the years. At the first visit, Dr. Johnson will focus on making your baby feel at ease in the dentist’s office during a “well baby exam.” These initial meetings can make the start of conventional preventive dental care more comfortable. As your child begins receiving the kind of care you expect during your routine dental exams, they also benefit from guided instructions on protecting their teeth between visits. By bringing your infant for a “well baby exam,” you help them feel safe and comfortable inside the dentist’s office. When this feeling of comfort is established, the start of regular visits can be easier for them. You should plan to make an appointment for this exam within six months of your child’s first tooth erupting, or by their first birthday. Dr. Johnson can offer important support for your child’s developing smile. If they develop an oral health problem, the appropriate restorative dental procedure can be recommended. The development and growth of your child’s oral structures will also be monitored, which means you can be alerted if there are any issues in need of addressing. 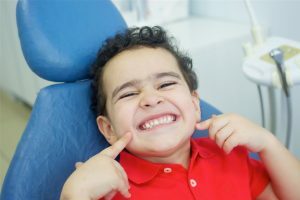 The benefits of treatment can extend to adulthood by ensuring your child’s smile is well-managed, and by making them more likely to keep up with smart dental care as adults. If you want to make sure your child’s smile is healthy and attractive, you should make sure they see the dentist for regular exams. Dr. Johnson is proud to offer a welcoming space for patients of all ages in and around the St. Louis, MO area! You can arrange an appointment for yourself or your child by calling Magnolia Family Dental in Kirkwood/St. Louis, MO, today at 314-822-4521.